Data Plane Development Kit (DPDK) is as set of fundamental development libraries for fast data plane packet processing. It includes core components, poll mode drivers, an accelerator, classification components, quality of service (QoS), extensions, and packet frameworks. Together, all of these components make DPDK an ideal development kit for data planes on server platforms such as Lenovo® ThinkSystem™. It is a key feature for high-performance data transmission scenarios like Network Functions Virtualization (NFV) and data center virtualization. 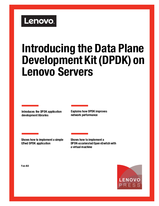 In this paper, we introduce DPDK and its technology and we explain the steps to deploy a DPDK debug environment from the source code on the Lenovo ThinkSystem ST550 server. Finally, we use an Open vSwitch application example to show how the DPDK works. This paper is intended for software developers, systems architects, and Linux systems engineers. It is expected that readers will have a good knowledge of Linux and networking.